We live in an age where human interaction is getting increasingly problematic. Not only are we surrounded by social media, which limits the face-to-face interaction, but the way we talk and express ourselves is also getting more and more limited. This is why when you just have to look for professional Chicago movers or any other service for that matter, you may get lost in all the information. Firstly, you do not know what the right questions to ask are, and you may not even have the nerve to ask them, even if you do. Secondly, assessing the information online may be a difficult thing to do. To help you with figuring out whether a company is reputable or not, we are going to give you some tips on the qualities you need to find in such a company. 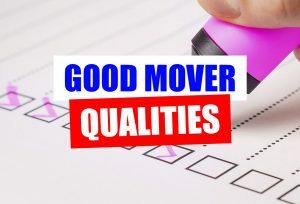 If one ticks all the boxes, you know those movers are people you can trust! You may be wondering why this matters, if everything you need is for someone to pick up some boxes and load them on a truck. Well, friendliness actually means a lot more than you think. People, who are genuinely happy to help you, can make the whole experience less stressful. Plus, you will just feel better throughout the move. There is something to be said about being happy with their job as well. Do you want your items to be handled by a grumpy mover, who can’t stop complaining about everything? Or do you prefer to see people with a smile on their face? I can guess which one you would pick. Now, how do you judge the attitude? By proxy! Call the company, talk to the staff. Are they friendly? Will they do their best to help you with your questions and booking? That can tell you a lot about the company culture, which usually translates to the workers as well. A reputable moving company will always work with you to give you the exact service you need. There are some movers, who’d want you to pay for things that you do not need, just because they are included in the service package. This is a foul practice you should do your best to avoid. Why pay for packing supplies, if you are doing the packing yourself and before any movers arrive? Why should you pay storage booking fees, if you do not need any storage whatsoever? Be mindful about the companies you choose. Take a look at the website, and do not fall for cool-sounding words. If the company is not prepared to give you a personalized service, they are not worth your time! These are just two of the most important qualities you should look for in a moving company. Stick with us next week too, as we will look into more traits that give up whether certain Chicago movers have integrity, or not! Just Moved? Make Your Place Homely!